Who says sugar-coated marshmallows need to go out of season when chicks and bunnies do? These homemade Peeps are delightful all year round. After all, who doesn't love the smiling poop emoji? Whether you want to gross out your friends, make your mother disown you, or playfully tell your ex how you feel about the breakup, these homemade poop emoji marshmallows are the perfect dessert for any occasion. They say, "Look at how much effort I put into preparing this kind of gross little dessert for you." To make these poop emoji marshmallows, first you need to dye some sugar brown. You may say, "Hey, can't I just use brown sugar." Nope. Thanks to the molasses in brown sugar, it would leave your final peep with weird clumps and hard, rock-like areas. We want our poops to have a nice, grainy finish. So pour a cup of white sugar in a plastic bag and start adding a whole lot of brown food dye. Sieve this brown white sugar onto a baking sheet and discard any clumps. Now, you're ready to make the poop pile itself. Make your marshmallows, and, while the mixture is still hot, put it into a piping back. Pipe out the piles of poop into small, 4-layered coils. Once you have all your piles of poop, pick up the dyed sugar with your hands and sprinkle it on top of each one. Now that they're all brown, it's time to make their faces. Cut up mini marshmallows (store bought) for the eyes and mouth, and use a toothpick to add dyed sugar pupils. 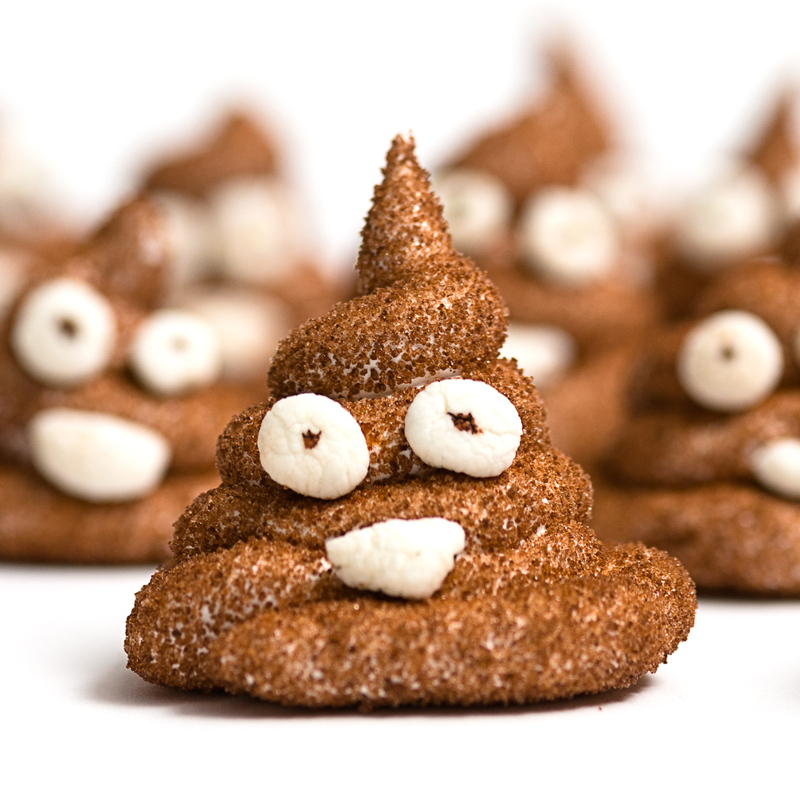 For detailed instruction on how to make and assemble your poop Peeps, check out Nomageddon.